This is one of our favorite collections! It offers a timeless classic called "The Original Mother's Ring". Since 1959, this manufacturer has been crafting the only rings that can rightfully be called Mother's Rings®. The beautiful ring and pendant designs in this collection generally ship in about 7-14 days... white karat gold, platinum or 18k and platinum rings may take an additional 5 days to ship. Rings, pendants and charm are available with genuine or simulated stones. 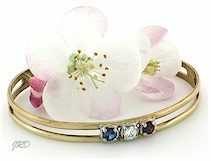 Cuff bracelet only offered with simulated stones. EMERALD NOTE: The emeralds now set in this collection are very LIGHT. DARKER emeralds are available however the ring or pendant will take an additional 7-14 days to ship. See individual mothers jewelry on this page for pricing. The Original Mother's Ring®... the most symbolic mother's ring available. Crafted from two bands of solid karat gold or platinum representing mother and father, this band is then set with either genuine or simulated stones to represent the children. Mom and dad's birthstones can also be added if you would like this special ring's stones to represent the entire family making it a family ring. Click here to learn more about this very special keepsake. Most items pictured are samples set with simulated stones. Many items are enlarged to show detail- refer to measurements provided on individual order pages to determine actual size. Custom karat gold mother's rings examples are noted and are also pictured for styles #OMR and #BW30 shown below only. rating information for this collection. Actual karat gold Mother's Ring. © Copyright 2003-16 J. Dunne. ALL RIGHTS RESERVED. Copying from this web site is a violation of copyright law. Pictures and content are for viewing only at this address and remain our property. They may NOT be copied, reproduced or modified in any form or manner. Use of this web site constitutes your agreement to our online store policies and terms. You must be at least 18 years of age to order from this store. We reserve the right to correct errors. Many of the items and designs are also copyrighted.